This topic comes up a lot. Why are old CPU designs still used? and used a lot. Every few years a company will make a statement about their new 32bit or 16bit CPU/MCU design that makes ‘migration from an 8-bit design easy’ or seeks to replace 8-bit microcontrollers entirely. It does not happen, and will not for decades. 8-bit processors first debuted in 1972 with the Intel 8008, so they are pushing 40 years. What many don’t realize is that 32bit processors debuted in 1979 (Motorola 68k and National Semiconductor 32k). So 32 bit is nothing new, and the same reason applies today as it did 30 years ago. Why use a Ferrari when a Chevy will do? Most designs simply don’t need that power, or complexity, 8-bits is MORE then enough to run a toaster oven, a bread machine, or your TV remote. Embedded.com had an article talking about this issue just last week. So why do companies say that their design will replace 8-bit? It’s good PR, it gets people talking about their new processor, and thats not a bad thing. Perhaps 2 of the most famous RISC architectures, ARM, and MIPS, have been around for years. Like many well designed architectures, they continue to be adapted, enhanced, and used in litterally billions of devices. On the topic of ARM, they have been working extensively recently with GlobalFoundries to provide customers with proven IP, specifically the ARM Cortex-A9. They are developing as a SoC core on a 28nm process. ARM currently works with TSMC to test, and prove various cores on TSMC’s process, and now will do so with GlobalFoundries. What this does in enable system builders to have IP blocks that are PROVEN on a given manufacturing node. It takes some of the guess work, and certainly risk, out of developing a ASSP, ASIC, or SoC. Yah a bit of merger madness, NEC Electronics has merged with Renesas, further consolidating the Japanese microcontroller market. This will put the new company third in global IC sales, behind only Intel and Samsung. It will be interesting to see which products survive the merger, as there will be some overlap. What does this mean for CPU collectors? Just as happened when Mitsubishi and Hitachi merged, deprecated and eliminated devices will become increasingly hard to find data on. In case you missed it last week, GlobalFoundries (the company AMD spun off to manage its foundries) has acquired Chartered Semiconductor in Singapore. This changes the playing field a lot in the foundry world. A world dominated by UMC and TSMC. Acquiring Chartered allows GlobalFoundries to dissolve some of AMDs interest in the company, as well as bring on board many more customers. Before, Global only had AMD, and STm as clients, now they have all of Chartered’s which includes such names as Toshiba, and Microsoft. A game changer for sure. While they are not as big as TSMC, they certainly will be making TSMC look over their shoulder more. This will help the foundry industry remain competitive and force TSMC and GlobalFoundries to remain innovative and on the cutting edge of fab technology. When you think of Atmel what do you typically thing? High Speed 8051 microcontrollers and AVR RISC processors. Maybe the occasional EEPROM. But there is another side of Atmel. 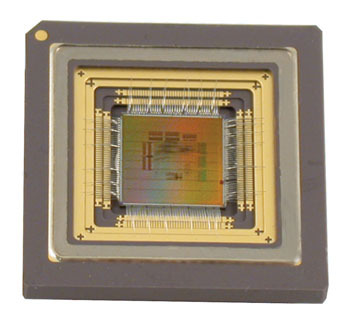 Atmel also makes a line of radiation hardened space qualified SPARC CPU’s. These are used extensively by the European Space Agency and other satellite builders. Atmel just released anew one too. The AT697F, a revision of the AT697E. What can it do? well oits a full 32bit SPARC V8 core, running at 100MHz (90MIPS). Its made on 0.18u which is very impressive for a space based processors. Most of Atmels other designs are basing on a half micron process. A larger process like half a micron gives increased radiation resistance, but at the expense of speed. At 0.18u Atmel has got the speed up to 100MHz, AND increased radiation tolerance to 300krads. To put that in perspective, a dose of only 1 krad (1000 rems) will kill you 99% of the time so these processors can continue to function at over 300 times that. TI has purchased Luminary Micro for an undisclosed amount of money. TI, one of the larger producers of embedded processors, and applications processors for mobile phones add significantly to their portfolio by adding Luminary, maker of ARM Cortex based microcontrollers. Most of TI’s line of processor are now ARM based. They do of course also make MCS-51 products as well as their VERY widely used DSP series (such as the TMS320 series). Windows and ARM: What the market needs. There has been rumors flying a lot lately about Microsoft possibly making a version of Windows 7 available to run on ARM based processors. Intel obviously is very much against this happening, which is why it NEEDS to happen. The current CPU market is starting to get stale. Intel has around 80% marketshare, and AMD is struggling to compete. This does not lead to innovation on the scale we saw back in the 90’s when there were several processor companies making Windows compatible chips. Currently the #1 processor for mobile devices is ARM (in its many flavors), It powers the iPhone, the Palm Pre, many Blackberries and hundreds of others. ARM processors run OS X, Android, PalmOS, and Windows Mobile (as well as Windows CE). We now are seeing growth in a new segment, Netbooks, and soon to be tablets. There are several of these that are ARM based and run flavors of linux, but the vast majority use Intel Atom CPU’s and run Windows XP. ARM processors, clock for clock, are more powerful, and more efficient then the Intel Atom. Windows 7 running on ARM processors would open up vast new oppurtunities in the netbook/MID class of devices both in software, and hardware. And perhaps more importantly it would force both AMD,and Intel to compete with better and more innovative products. Intel would need to shift some of its focus away from AMD, and into competing with ARM, allowing AMD to grow as well. ARM licensing scheme would also allow us to break away from the choke hold that Intel currently holds on the x86 style architecture. The end result? More speed, features, and efficiency for the consumer, and a much more stable processor industry. Performing your banking with an unsecured connection, or surfing the web without a anti-virus is dangerous to say the best. Your data may become compromised which of course could serious ruin your day. These problems extend to the hardware level as well. In such things as your microwave, their is software running on the hardware to control it. It would be possible to extract this software code given the right tools. Stealing kitchen appliance code is not a particular threat obviously. However, there ARE applications where the software running on a set of hardware IS very important, more so often then the hardware itself. Take for example the battlefield management software on a tank, or the flight control system on a F-22A Raptor. This is not something you want someone to be able to recover. Several companies make what are called ‘Secure Processors.’ These are processors designed to keep the code on them VERY secure. Above is one from Maxim, tamper with it, and the SRAM is auto erased to all 0’s rendering the code useless. It has encrypted data buses, on-board AES encryption, random key generators, the works. A Company called CPU Tech has a processor called the CPU872, which is now available for commercial use (previous designs have been DoD only). Programs are securely booted from encrypted flash and decrypted onto on-chip embedded DRAM, and neither cleartext nor the decryption key is ever accessible, according to CPU Tech. In a multi-processor system, all I/O communication between CPU872 devices is also secured, according to the firm. This processor includes 8MB of onboard DRAM, as well as a pair of 800MHz PowerPC 440 cores. The security however doesn’t start at the chip; CPU Tech only uses ‘Trusted Foundaries’ in the manufacture of their parts, to ensure malicious hardware is not added to the part during fabbing. 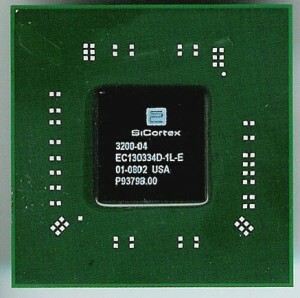 SiCortex is a supercomputer company, or as they are called today ‘High Performance Computers’ (HPCs). HPCs have traditionally taken vast amounts of room, and vast amounts of power. SiCortex has changed that. Their fastest offers 5,832 1.4GFlops 64-bit processors, each dissipating just 900 milliwatts of power. All interprocessor communications logic plus two DDR-2 memory controllers and PCI Express I/O logic are on the same node chip with the multiple processor cores. Complete with its 8 Terabytes of system memory, the SC5832 fits in a single cabinet and only requires around 20 kilowatts of wall power. These nodes, shown above, each contain 6 MIPS64 cores running at 700MHz, a pair of DDR2 memory controllers, gigabit ethernet, an 8xPCI Express controller, and 256k of L2 Cache, quite impressive. 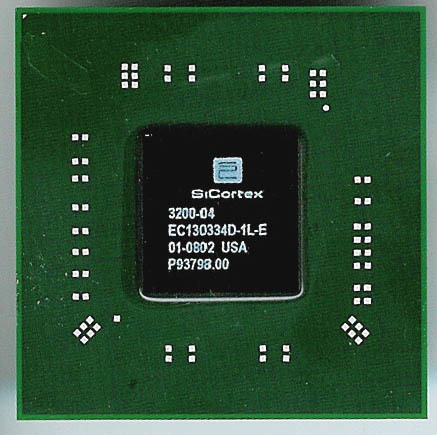 Much thanks to SiCortex for donating this node chip to the museum. Microchip has now shipped almost 7 billion of the legendary PIC processor line. Still being made, and improved today, the PIC has been around for a very very long time. General Instruments created the PIC16 in 1975 to make up for the bad I/O of their CP1600 line. Later GI spun this off into Arizona Microchip Technologies in the late 1980’s and what is known today as simple Microchip. Here is an original PIC1655A made in 1979. And here is the same part (albeit now in CMOS) made in late 2001. Old designs such as the PIC, and the MCS-51 remain immensly popular, they are inexpensive, and have over 30 years of code base to work with.